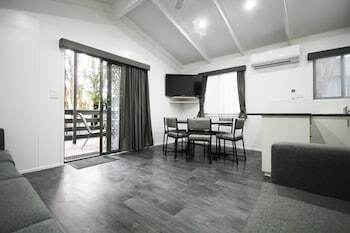 Located in Badger Creek, BIG4 Yarra Valley Park Lane Holiday Park is on a lake, a 3-minute drive from Healesville Wildlife Sanctuary and 6 minutes from Four Pillars Gin. Featured amenities include laundry facilities, microwave in a common area, and refrigerator in a common area. Free self parking is available onsite. Located in Euston, Euston Club Motel is a 1-minute drive from Old Euston Courthouse and 8 minutes from Robinvale Leisure Centre. Free self parking is available onsite. Located in Flaxton, Treetops Accommodation Montville is a 1-minute drive from Kondalilla National Park and 6 minutes from Kondalilla Falls. Free self parking is available onsite. Located in Bramley, Margaret River Hideaway is a 5-minute drive from Brewhouse Margaret River and 6 minutes from Jahroc Galleries. Free self parking is available onsite.